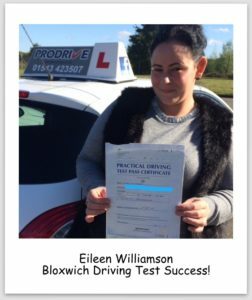 Many congratulations to Eileen Williamson from Bloxwich on passing her driving test at the first attempt at Featherstone Driving Test Centre! Eileen can now enjoy doing the school run in her car. Safe driving from Neil Parkes at Prodrive Driving School. Eileen said “I chose Prodrive Driving School after a recommendation from a friend. Learning to drive was good compared to what I expected and the teaching methods were brilliant. I would recommend Prodrive to friends because Neil makes you feel relaxed and he is good at what he does. DRIVING LESSONS CANNOCK, DRIVING TEST SUCCESS FOR EMILY!